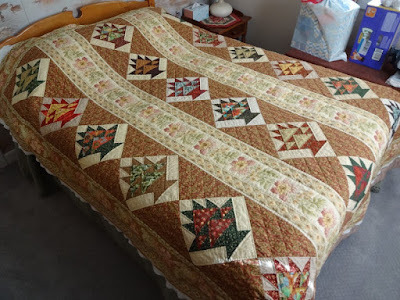 It seems I've been hand quilting this one for years, and I guess I have. But night-before-last I finally finished the last of the center strips, and could finally move on to marking and beginning the quilting of the outer borders of my basket quilt. After removing the hoop I immediately threw it on the guest bed for a quick pic. This was a quilt featured in an older Fons and Porter book Fat Quarter Friendly, and their version was called French Country Strippy. 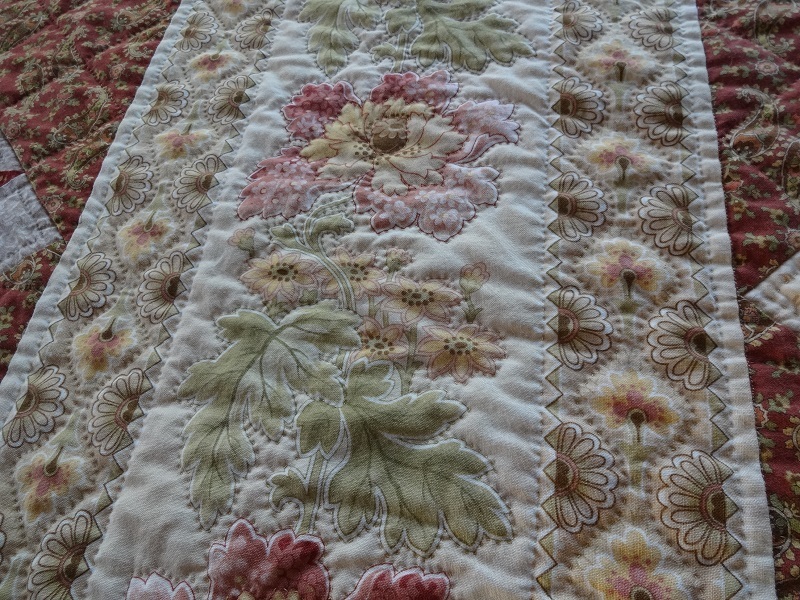 The batting I used for this one is Hobbs 80/20 and so the quilting generally isn't well defined, but in the late afternoon light as I was marking the outer borders I was able to capture all the torturous outline quilting of the inner floral strips that seemed to take forever and a day. The outermost borders are now marked with a linear stencil. Not doing that outline around the flowers thing again. I'd like to see this one finished sometime in this decade! I'd hoped to finish the remaining rows on the Christmas top over the weekend, but the birth of grandbaby number nine and an 80th birthday party for my sister-in-law on Sunday put the kabosh on that idea. Grandbaby though he arrived early and tiny, is already home and doing great. His big brothers are smitten, not to mention the new dad and mom, and grandparents! Though I'd love to share a photo of the little guy, I've made the decision to not post any more family photos on my blog due to the number of phony Bloglovin 'followers' that keep cropping up in my stats, all of which are associated with far less than desirable websites. If I knew how to completely close my Bloglovin account without having to close out this blog, I'd do so, but in the meantime I'm trying to be extremely careful about my post titles and will keep comment moderation active in the hopes of not having any unsavory things appear in the comment section. That's all I know to do, as I'm old-school and not terribly computer savvy. After several days of sunny, almost balmy 50-60 degree weather our snow is almost gone, the creek is treacherous with all the ice break-up and thaw, and tonight the temperatures are dropping back to the freezing mark. And winter begins again. More quilting time before the rakes and rototillers come out again! 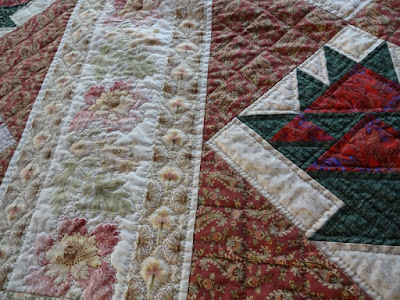 Your quilt is incredibly beautiful, and your quilting is equally beautiful! I'm glad you got it finished,and I'm sure you are too! ---"Love"
So beautiful! Love all the quilting details but know it takes far longer than most of us can endure. You have such stamina to carry on. Hoping the rest moves quickly to a full finish. I dropped the photos of family for the same reasons. You can not stop those vile creatures from grabbing your pix. Oh it is stunning! Hand quilting does seem to take forever, but in my opinion it is well worth the wait. I love it! And I wholeheartedly agree about the posting of grandchildren photos. My daughter wouldn't allow anyone to post at first, but I have been able to post a few (from a far distance). What a sad state that we are don't share the joys of our family for fear of creepy people! What a gorgeous quilt! 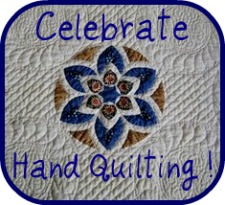 your hand quilting looks so pretty and I can just imagine how nice it feels. The colors are so harmonious and cozy. Congratulations on a Traditional Heirloom quilt! 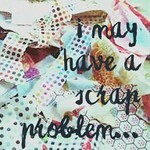 I admire any one that hand quilts, I would never finish the first one, plus my stitch's are pitiful. Such a lovely quilt! 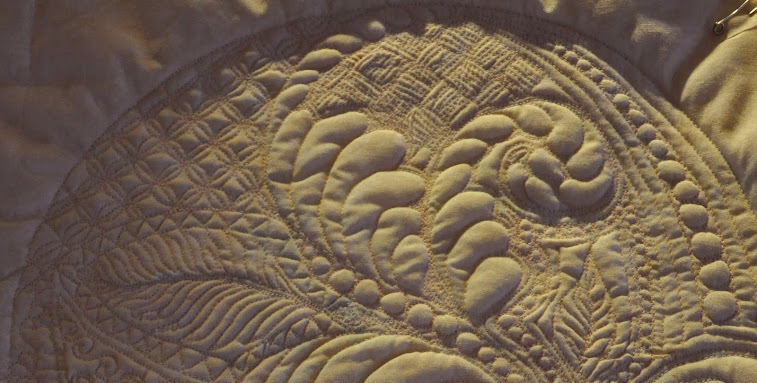 So wonderful to see other quilters that are still hand quilting. Your quilt is absolutely gorgeous. It is definitely worth all the years of work! Congratulations on the new grandbaby. Enjoy those snuggles. So much quilting! You are doing a lovely job on a wonderful looking quilt. The stitching just makes it better! Beautiful! So happy for you that it is getting closer to a finish. Just beautiful!! There is something so satisfying about handquilting even though it seems to take forever. Your stitches are lovely. Don’t you feel that with each stitch, part of you goes into the quilt.